MEXICO CITY, Jun 11 2012 (IPS) - Year after year, women in rural areas of the southeastern Mexican state of Tabasco have to get ready for floods that threaten their homes, crops and livestock. “We have adapted. Now we build our houses on stilts,” Celia Hernández, who works for an indigenous tourism project in Centla, 857 km south of Mexico City, told IPS. “Every year in June,” she said, “the women start putting things away and preparing the older people and children,” in case there is flooding and everyone has to evacuate their homes and take refuge on higher ground nearby. Centla, a municipality with a population of 102,110, lies either side of the Grijalva river in Tabasco, a state of 2.2 million people. 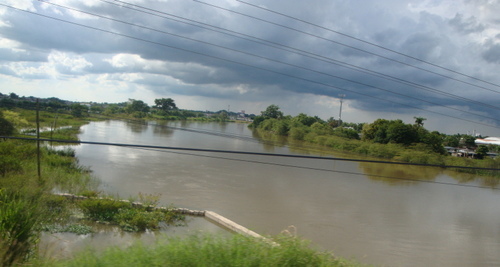 In the rainy season between June and October, the water level rises and affects urban and rural areas, including Centla, which is located in a swampy region and is home to 25 rural communities and 53 “ejidos” (collectively owned farmlands), as well as the coastal town of Frontera, the municipal capital. “People lose everything they own. The government provides some economic support, but it only covers part of the losses, so we have to start again, over and over,” said 18-year-old Hernández, who lives with her family in a rural community where people are involved in tourism or fishing. Since 2007, Tabasco has been hit by the highest and longest-lasting floods of recent decades, in territory that is highly vulnerable to climate change effects such as more intense rainfall, mudslides, rising sea level and loss of biodiversity, which harm the welfare of the communities. “This is changing women’s way of life and the traditional activities they have carried out for years,” María Hernández, in charge of gender equality issues for the Santo Tomás Ecological Association (AEST), a local NGO, told IPS. “The floods leave women psychologically devastated and economically destroyed. They have difficulty recovering their livelihoods,” said María (no relation to Celia Hernández). “People used to know when they could plant this or that crop, but now they don’t know. Women take charge of supporting the family and looking for food for their children and husbands,” she said. The devastation wrought in Tabasco by floods in October and November 2007 was assessed by the Economic Commission for Latin America and the Caribbean (ECLAC) at over three billion dollars. Since then the AEST has supported groups of women in four municipalities, providing training to cope with recurring climate changes, psychological assistance and support for carrying out development projects like poultry farming and family vegetable gardens. 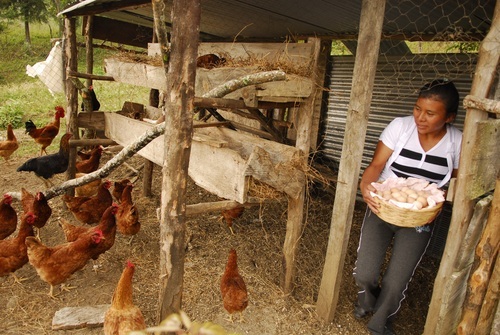 In rural areas of Tabasco, women grow maize, tomatoes and other vegetables and raise chickens and turkeys, complementing their husbands’ work which focuses on fishing. Tabasco’s climate, with an average annual rainfall of 2,550 millimetres, and its 28 rivers and four dams make adaptation and mitigation measures necessary. Together, these can create climate justice for women. After the 2007 disaster, the regional government created the Reconstruction and Reactivation Programme to Transform Tabasco, one of whose goals is to complete the building of 3,500 housing units on high ground around Villahermosa, the state capital, benefiting women in particular. “Women made homeless by the floods were relocated as part of a policy of adapting to climate change,” Dolores Rojas, programme coordinator for the Mexican office of the Berlin-based Heinrich Böll Foundation, told IPS. “An interesting aspect of this policy is that women were given the title deeds to their homes. This meant they could decide to start a small shop in their home, for example, without needing to ask their husbands’ permission,” she said. However, there have been some problems. Families who moved to the houses faced higher transport costs, because their new homes are far from the centre of Villahermosa, a city of 560,000 people, and there is a lack of services, Rojas said. The policy lays the foundation “to advance toward greater gender equality,” the 2011 study concludes. The national water commission, CONAGUA, and the Engineering Institute of the state National Autonomous University of Mexico consider it a matter of urgency to relocate over 66,000 people living in 18,000 dwellings in 107 communities at risk of flooding. But not everyone agrees with the relocation. Some local organisations call it forced eviction, especially in rural areas like Centla. “What we want is more financial support, because (the government) focuses mainly on urban areas. Close to the rivers, flooding is inevitable,” but people are reluctant to leave their places of origin, Celia Hernández said. Civil society organisations complain of bad planning in Tabasco that has allowed construction in at-risk areas, and poor management of the dams, which release excess water when they reach maximum levels. The overflow often floods the surrounding communities, as happened in 2007. “In order to protect Villahermosa, the floodwater is being diverted to the rural communities. People have to leave their homes and are relocated in another area, where they have nowhere to farm,” complained María Hernández. As a result, “the pressure of supporting a family increases and gender violence gets worse,” she said. Because of the recurring floods, the women have had to diversify their activities, since recovering their crops was impossible. “Relocation plans should include a gender perspective so as not to give only partial solutions; a comprehensive policy is needed. It’s an expression of climate justice,” said Rojas. Women “are more exposed to risks, and their vulnerability depends on their socioeconomic status. Resettlement partially compensates for that vulnerability,” she said.